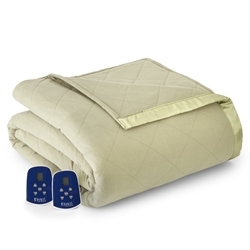 Our soft green meadow Micro Flannel® heated electric blanket gives any bedroom a gentle sense of spring while offering superior warmth and durable quilted construction. Our innovative light green Micro Flannel® heated electric blanket combines the best of classic quilted style with durability and practicality, ensuring that you’ll enjoy this luxurious heated blanket for years to come. Not only is this heated electric blanket is machine washable, lightweight, and bulk-free, but it also features our patented 7 Layers of Warmth™, including Micro Flannel®, down alternative fill, specially-crafted electrical cloth, and a quilted layer of heating elements.